With the increase in popularity of solar energy, it’s time to dispel some myths that have been hanging around. So let’s get our science coats on and do some investigating! Myth: Solar is very expensive – Solar is becoming more and more affordable by the day as greater numbers of installers, retailers and customers adopt the technology. Myth: Solar can only make a small contribution – Solar is already having a large impact on households and businesses today. By shifting usage to during the middle of the day, a decent sized system can offset much of the evening usage in the home. Myth: Solar is not developed enough to be a large scale solution – Solar technology has come a long way, it’s now at the stage where it can be economically viable in homes through increases in panel efficiency and output. Myth: Renewables can’t compete with fossil fuels – Fossil fuels are very heavily subsidised by the government, renewables can be a major force in generation if supported. They also don’t damage the environment, so there’s that too. Myth: Solar panels depreciate the value of my home – On the contrary, solar panels increase the value of your home because they represent a reduction in the cost of running that home. Plus the investment of solar makes a home more attractive to prospective buyers, especially since solar panels last many years and come with significant warranty periods. Myth: Solar panels damage my roof – Solar panels are installed on racks, not directly on the surface so they don’t damage your roof. Solar installation is a very heavily regulated and monitored industry to ensure damage does not occur. Needless to say, you should still choose accredited and reputable solar installers. Myth: Solar panels don’t work well in cold climates – Solar panels require sunlight to capture energy, not heat, so they still work well in cold conditions. They even work in overcast conditions, although it does impact on performance. Myth: Solar panels require too much maintenance – Actually, solar panels require very little maintenance at all, you might have to give them the odd rinse every now and then but other than that you’re all set! Help: I don’t know who to trust about solar – The industry is convoluted, with many different installers, products, prices and system types. If you want to know about solar, need help with your system or want to install panels, talk to Mojo. We’re solar experts who can help you get the most out of solar technology. Get in touch here. Solar really has come a long way in this decade. We’re constantly seeing new innovations and applications of solar technology and it’s easy to imagine a bright future (pun intended) given the increase in popularity of the technology. 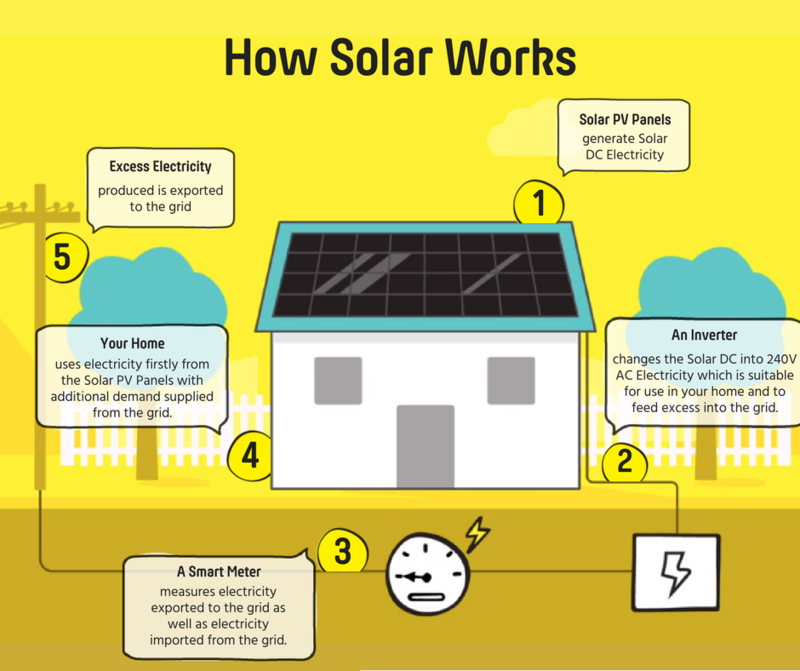 Check out our diagram below for more info on solar, but safe to say we can call these myths BUSTED!